Definition at line 36 of file lllivefile.h. Definition at line 72 of file lllivefile.cpp. Definition at line 77 of file lllivefile.cpp. Definition at line 164 of file lllivefile.cpp. 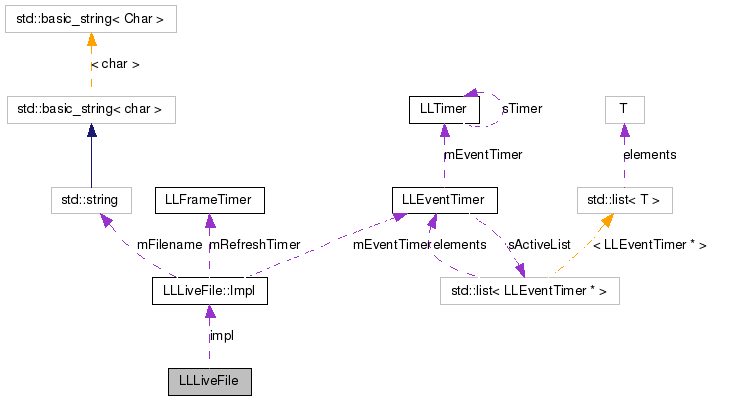 References impl, LLLiveFile::Impl::mEventTimer, and LLLiveFile::Impl::mRefreshPeriod. Definition at line 128 of file lllivefile.cpp. References LLLiveFile::Impl::check(), impl, and loadFile(). Definition at line 138 of file lllivefile.cpp. Implemented in LLLiveAppConfig, and LLMessageConfigFile. Definition at line 56 of file lllivefile.h. Referenced by addToEventTimer(), checkAndReload(), filename(), and ~LLLiveFile().